Things are getting smarter in business – quite literally. Everything from light bulbs to lifts to your product inventory can be a smart object that you can track, model and make predictions about, thanks to sensors that tell you where they are and how they're performing. That means the Internet of Things isn't just for big businesses and smart cities; any business that has physical assets can take advantage of IoT. 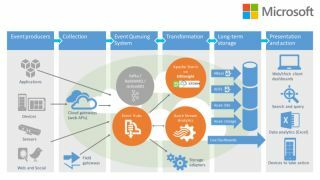 That's why Microsoft is bundling up all the IoT services on its Azure cloud into the Azure IoT Suite, and offering a Quick Start program of free half-day workshops to help businesses build proof of concept systems for handling their own things. "The idea is to help them to understand some of the challenges they face in business and what IoT can offer to help them," Microsoft's Sam George told TechRadar. "IoT is an ongoing journey. The first stage is figuring out what business problems companies can tackle with IoT and moving them along in that. With this, a business can start with a very tactical business challenge, they can build a solution to help them with that and then they can expand into additional products and services. Quick Start is a way of getting on that track." The plan is to pass on what Microsoft has learned from helping larger companies build IoT systems – like Transport for London's asset tracking and predictive analytics, NEC's FieldAnalyst system that does facial recognition, analyses the age and gender of visitors and tells you more about traffic patterns, or the system Rockwell Automation uses to monitor oil wells and petrol pumps – to smaller businesses who don't have those kind of resources. The IoT Suite brings together some existing Azure services and some new services that will come out later this year, for a single price. "What we're enabling with this is simplified solutions as well as extremely simple billing and we're making this available very broadly when before it has only been available to larger companies. Customers can quickly provision solutions for asset management, remote monitoring and predictive maintenance. It includes Event Hubs, Stream Analytics, HD Insight, Storm, Azure ML, map-reduce … Power BI for rich visualisation will be part of the suite. "And there are some new services that we're developing to enable extreme scale not just for telemetry ingestion but for command and control, device management and device identity and registration. We'll announce those later this year." Those will include services based on Microsoft's open source ConnectTheDots.io project for building sensor boards using hardware like Arduino UNO or DUE, Raspberry Pi, Gadgeteer or Intel Galileo. If you need help picking sensors to make your things smart, you can do that as part of the Quick Start, George said. "Some customers have already figured out their hardware needs, but some customers are looking to us for recommendations. We will have quite a comprehensive set of partners around hardware that we will recommend to customers if they're looking for that." The suite will even include services that will let you monitor the sensors and the data stream you're getting from them to make sure the system is collecting information correctly. There will also be some finished IoT solutions that businesses can adapt to their own situation rather than starting from scratch. Getting the pricing right will be important. "Customers tend to start with modest deployments and scale up from there," George points out. "We're designing the solution to scale to the millions and tens of millions of devices. But we want to make sure that a customer doesn't have to start with modest deployment and completely resign it when they scale up. "As part of the suite we will be providing simple billing so customers can model what their costs will be as they scale from small deployments up to the massive IoT scale. If they're considering that, they want predictable pricing." Given the number of reports on how poor the security is in many IoT devices and systems deployed so far, George thinks Microsoft also has an advantage given its experience with security and privacy. "We will provide comprehensive guidance for customers on the best way to make sure they secure their solutions in ways that are easy to do out of the box and ensure privacy end-to-end. "One of the reasons customers are excited about Microsoft being in IoT is that they realise how seriously we take security and privacy and they want the lessons we've learned over the last few decades in security and privacy – things like threat models." That's also going to include considering how businesses use any data they're collecting from their own customers. Microsoft's chief privacy officer recently noted that there needs to be a trust framework for the IoT that includes transparency about the data collected and how it is used. He suggested the equation: "Trust = Privacy x Value x Security" – and noted that if any one of the variables equals zero, then trust will be zero. If the Azure IoT Suite can deliver what you want to achieve with IoT, a Quick Start session could help your business avoid some expensive mistakes.